Dinner last night was a huge success. I didn't eat much of the birds, but Conrad seemed to enjoy it. The ratatouille with pasta and parmesan is always a favorite in the Frame house, so baby and I were quite happy. The birds just fell apart when I took them out of the crock pot, and one of them spread his legs wiiiiiiide open and exposed all his inappropriates. We tried to invite a few friends over for dinner because, hello, this was absolutely enough food for four people. Also, leftovers don't usually fair well in our house. Day-old food isn't usually our thing. 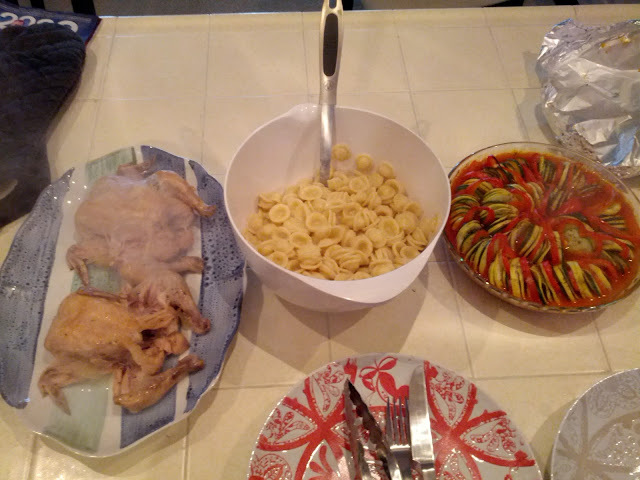 None attended, and we were stuck with the leftovers, which baby boy and I were actually pretty excited about. We like friends, but we like good food more than almost anything, so... Also I'm on a kick where I don't want to throw any food away, especially now that I'm on a much tighter budget. The ratatouille is great the first night, but even better the next day, and pasta is always usable for a later meal. Conrad and I ate one bird (well, I had one or two bites of the cleanest white meat I could find, and Conrad ate the remaining meat), and I picked all the good meat off the second bird and stuck it in a pyrex. I figured I could use it for tomorrow's meal, maybe a salad or something. In a crock pot, place the sliced onions and pour the 2 cans of broth. Rinse the thawed hens inside and out, then season semi-generously with lemon pepper, salt, and garlic salt. Place the hens in the crock pot. They should be covered in liquid about half-way up. Place the lemon slices on top of the hens, and tuck between wings, if you have enough. Cook on low for 8-10 hours. Turn the hens over halfway through cooking time, just so the exposed meat doesn't get dried out. Once finished cooking, remove lemons from crock pot and throw away. Enjoy the birds with veggies, pasta, or however you want! I took the broth and juices that were left in the crock pot and blended it with the cooked onions. It resulted in a super-flavorful semi-homemade chicken stock that you can use again later (Ina Garten and Sandra Lee would be so proud). You could use it as a soup base, to cook risotto, or in homemade gravy. Store in the fridge in an airtight container. I don't know how long it will last, but I plan on using it within 3-4 days. Put some of the leftover hen in a mug omelet with some veggies and cheese. I did this the other day and it's SO yummy. And very filling. Yum! My husband used the leftover meat in a sandwich with some lingonberry jam. It was his take on a turkey-cranberry sandwich, and he says it was awesome!